We haven’t spoken in about two years, I believe, and you probably don’t remember who I am. Anyway, my name is Zac and I was a friend of Dillon’s. I just wanted to let you know that I still think about Dillon and your family every day and that Dillon is in my heart and inspiring me to do things here in my second year of college that I never thought I was capable of. I’m at Gonzaga University and loving it. I am involved in a couple of different mentoring programs as well as a service organization where we work with recovering drug addicts and the homeless community of Spokane. 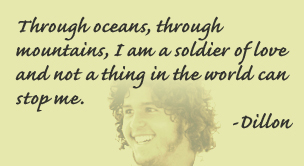 I know that Dillon would be doing even greater things and would still be changing the world with his words and actions. Feel free to write back or not, but I just wanted to say hi. I hope that all is well as it can be.